Two strange mirrored beings have crash-landed on the Earth. They know nothing of human behaviour, but are curious and keen to learn from the people around them – you! Will they mimic humour, kindness and compassion, or show a darker, more selfish side of humanity? And what will happen when they meet someone who society sees as ‘different’? 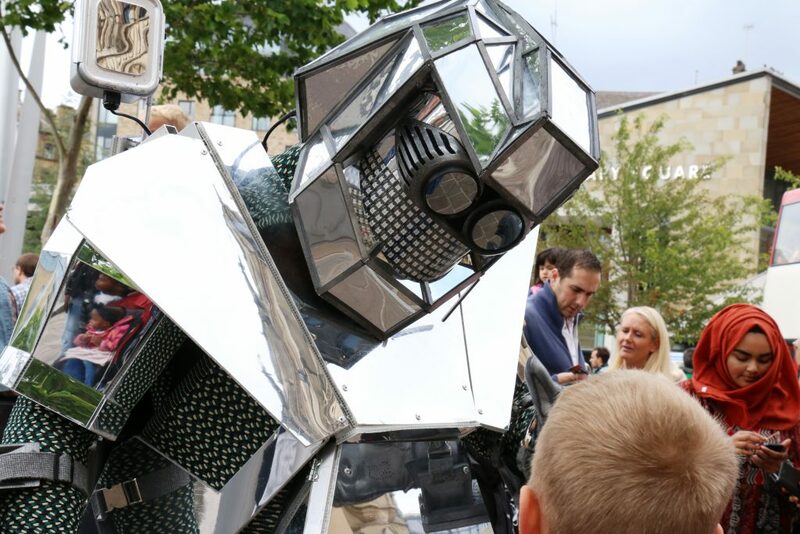 Mirror Mirror is the latest interactive street theatre experience by Mind the Gap. A seamless integration of audience interaction and storytelling, this costumed walk-about production is fun, eye-catching and popular with all ages. Two strange mirrored beings have crash landed on Earth. Using inbuilt AV to speak to the audience though pre-recorded and live-recorded sound, they tell their back-story of a planet destroyed and people displaced. Using playful imitation and physical theatre techniques the characters literally reflect society – our behaviours, our humours and our prejudices. Mind the Gap is one of Europe’s leading learning disability theatre companies that create work for UK and international audiences. Mirror Mirror has been created in collaboration with Kazimier Productions, creators of interdisciplinary multimedia shows for a variety of contents, from intimate immersive theatre to mass audience outdoor spectacles.